Here I’ll look back on over 50 years of photography – thoughts, equipment, objectives, ideas. It still looks good, mainly because I never used it a lot. I was very much an amateur geologist in those days, collecting rocks, fossils and minerals for all I was worth, and black and white shots from this camera were used to illustrate two school projects – one on the geology of Kilve beach, in Somerset; and the other for a study of coastal features around Weston-super-Mare (also in Somerset), for which I won the school’s regional study prize. Aged around 15 or 16, I spent much of my free time caving in Somerset’s Mendip Hills. A small group of us were interested in geology, and descending into caves was a natural progression of this interest. My friends started taking flash photographs underground with cameras only a little more sophisticated than my (flashless) Kodak 127, and then they progressed onto 35mm format – and I wanted 35mm too! However, times were bad – my family had just fallen apart. My father had left, and my mother and I lived in distinctly reduced circumstances, with my mother’s parents. However, Mum found the money somehow and, for Christmas 1966 I received an Ilford Sportsman 35mm camera. I was in heaven! The Brownie 127 had but a single aperture and shutter speed, but the Sportsman had apertures from of F2.8 to F22, and shutter speeds from 1 second to 1/500th, and it would synchronise with flash. I couldn’t afford an electronic flash, and so used flashbulbs. You fitted a flash bulb into the flashbulb holder on the flash, and then took your flash photo – after which the bulb was cloudy, bloated and busted, and you ejected it from the flash unit and threw it away – which all seems impossibly archaic now! I used several handheld exposure meters, remembered to point them a little towards the ground if that was what I wanted to expose for, and photographed with mainly Ilford black and white films: FP3 and the faster HP3. My films were developed commercially and, my school (and later my university too) having a darkroom, I made mostly clumsy and blundering attempts at printing. My friends were also shooting (and projecting) colour slides and I soon followed suit, although only being able to afford a slide viewer, rather than a projector. And here’s something I want to be honest about, because it troubles me. Later in life, in my twenties and entangled with a woman, I gave her that Sportsman to (further) curry her favours – and still regret it, and feel guilty about it, to this day. How could I give away my mother’s hard won gift? We are capable of such heartless things in our youth. Later, I yearned for a Single Lens Reflex (SLR) camera with Through The Lens (TTL) exposure metering, and bought a Praktica LTL SLR, sometime in the early to mid 1970s. Composing and metering via the viewfinder were just fantastic! The camera took screw fit lenses, which wasn’t ideal – both in terms of the time needed to change the lenses and the increased likelihood of introducing dirt into the camera body (i.e. as against a bayonet mount) – but being able to change the lenses at all was just wonderful. The camera came with a 50mm F2.8 Tessar standard lens, and I can also remember adding a 29mm Pentacon wideangle, and a far superior Pentax 135mm SMC (Super Multi-Coated) Takumar telephoto. I was very much a birdwatcher in those days and so aspired to photographing birds. I bought a preset (i.e. non auto-aperture) 400mm telephoto and used it mounted on a rifle stock, but my efforts were seldom much above mediocre, and bird photography – which requires much time, know how, patience and good equipment – has never been a favourite of mine, except on rare, opportunistic occasions. After a while I tired of the limitations of the Praktica kit (or were the limitations I tired of my own?) – sold the lot and started a long love affair with the smallest and trendiest SLRs around. 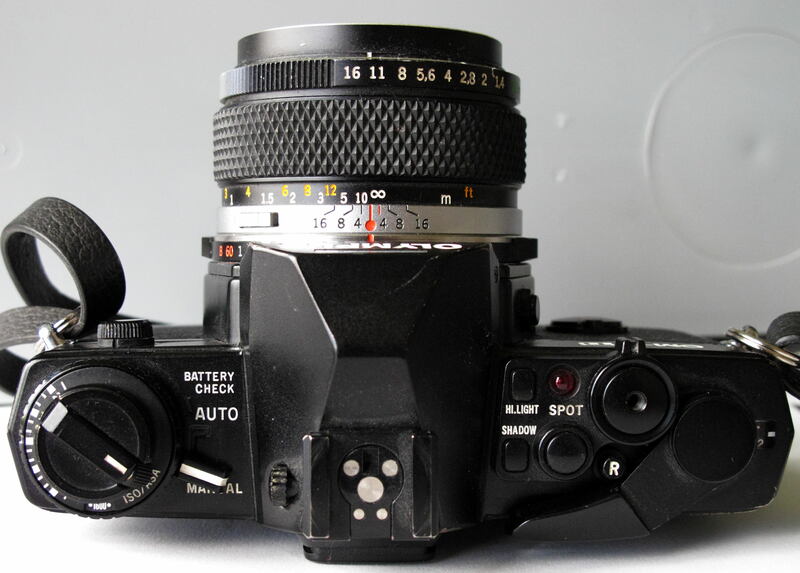 Here is the OM-1 that I bought as a second camera in case my OM-2 expired – but which I enjoyed using more than the OM-2. This is the OM-1 used for most of my Kenya photos, and the one I took on the trek up Mt Kenya. The lens is not the original 50mm: this camera body is heavily infested by mould, and so I bought a cheap, more modern 50mm F1.8 Zuiko just to keep on the front of the camera. 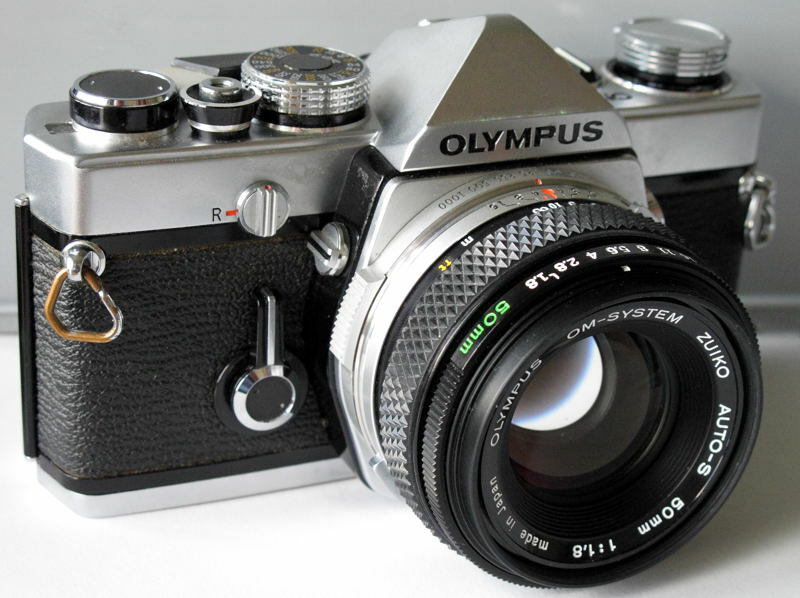 The Olympus OM-1 SLR burst onto the market in 1972 – and instantly made most of the other SLRs of the time look big, cumbersome and rather dated. The OM-1 was small, quiet, tough and lightweight and, a true system camera, it came onto the market along with a wealth of small and really good quality Zuiko lenses and other accessories. The viewfinder was wonderfully big and bright, making focusing very fast and positive and, and – and I wanted one! The unfortunate thing was that, at that time, I was a relatively poor postgraduate student and the OM-1 was financially far beyond my grasp. I bought a cheaper Praktica SLR and some lenses. However, by the time the OM-2 appeared in 1975, I had a ‘real job’ and more money – and the thought of an automatic (aperture priority) version of the OM-1 was both highly attractive and financially attainable. I bought one. It came with a 50mm F1.4 Zuiko standard lens which I still use, and I also splurged on the first of Olympus’s OM zooms, the 75mm-150mm F4. Both of these lenses are silver noses, i.e. they have the silver coloured front mount ring characteristic of the earliest Zuikos. An excellent and truly diminutive 28mm F3.5 Zuiko was added later, as was a secondhand OM-1, bought as a back up to the OM-2. And, lastly, when a job in Kenya appeared I added a Vivitar 400mm F5.6, to photograph wildlife. 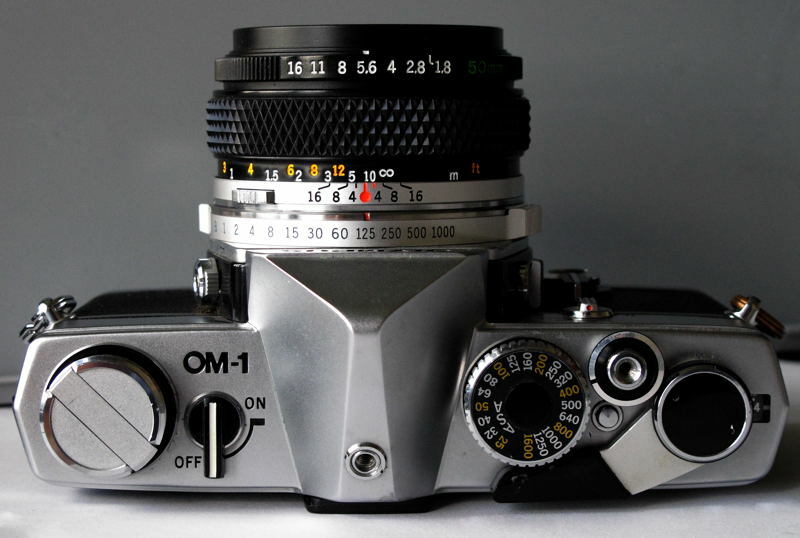 The classic, uncluttered top plate of this OM-1. From left to right: huge, easily grasped rewind knob, with long rewind leaver folded down; simple On/Off meter switch (one of the OM-1’s weak points); screw socket to mount a hotshoe flash; ASA (ISO) dial, which is adjusted by depressing the small button almost directly below the shutter release; shutter release in metal cup which makes for very gentle depressing of the release; sturdy wind on lever; frame counter under protective window. Just above the shutter release is a very small red spot: this spot is on the small switch that is turned to allow rewinding. Note the shutter speed ring concentric with the lens mount: all OM cameras had this. So when I departed for Kenya in 1977, with me went the OM-1, OM-2, 28mm, 50mm, 75mm-150mm and 400mm, and some other accessories like auto extension tubes and a polarising filter. I should explain that the main reason for my going to Kenya was to see the birdlife of sub Saharan Africa, the Earth’s Afrotropical Region. I was very much a birdwatcher first and a photographer second in those days – but I did very little photography of birds. So, travelling around Kenya, my most prized possession were the pair of Zeiss Dialyt 10x40B binoculars that habitually hung around my neck. The camera gear was not so important and, not wishing to be weighed down with more camera gear than could be carried in my old but prized WWII gas mask bag, I took to carrying just one OM body, and the small 28mm, 50mm and 75mm-150mm Zuikos. The 400mm was just too big to carry around all of the time, and also required a tripod to be of much use with slow slide film, and so only came into play on comparatively few, definitely targeted trips, e.g. early mornings at Lake Nakuru. Two interesting points about my photography emerged in Kenya. First, although the OM-2 was undeniably the more advanced camera, I felt happier using the purely manual OM-1, and I think that I took most of my better Kenya photos with it. I can’t entirely rationalise this, but the OM-1 just seemed to feed my creativity more, I got into better shooting positions with it. However, as with many OM-1s, the exposure meter switch eventually stopped working and I was pushed onto the less enjoyable but still hugely capable OM-2. Second, its well known that every photographer has his or her own favourite focal length(s) for lenses – these are the lens or lenses that best replicate how each individual photographer sees the world. Carrying the 28mm, 50mm and 75mm-150mm, the vast majority of my Kenya photos were taken at either 28mm or 150mm – and I often felt that I wanted both of these lenses to be more extreme, i.e. wider than 28mm and longer than 150mm. So, at that time, I could probably have made more productive use of 24mm and 200mm optics but, not being primarily a photographer, I didn’t buy them. I did upgrade to a superb 28mm F2 Zuiko but, by the time I had it, I was heavily involved in work on the Kenya bird atlas and photography – except for snaps of my family – really did take a back seat. And finally, although my later years in Kenya saw me manoeuvring vehicles full of safari clients into optimum positions to photograph the incredible wildlife, I never carried a camera on those trips because it would have been just one more thing to lose, break or have stolen, and having my own camera would doubtless have led to a nagging, ongoing conflict of interest with my job, i.e. do I set up photographic opportunities for my clients – or for myself? The Zuiko lenses that I used in Kenya are still in good condition, and I used them in the UK in later years (see below), but both the OM-1 and the OM-2 have succumbed to use in the tropics by growing a lush crop of internal mould. I still keep them on display, for sentimental reasons. Listening to my old OM-1’s shutter fire is magical, its so quiet – and of course that’s just what Olympus’s Chief Designer, Yoshihisa Maitani, had in mind for the OM series – that they would be the japanese equivalents of Leica’s famed M series rangefinders. In fact the very first camera of the OM series was actually called the M-1, until a legal challenge from Leica (based on the M3, M6 and so on names of their world beating rangefinders) forced Olympus to change to the name to the OM-1. I returned from Kenya to live in England and photography took a backseat for awhile. But in 2003, having really done as much birdwatching as I felt I wanted to do, I began to have ideas about starting up my photography again, and this time I did so with a deep interest in creativity, personal expression and modern art – especially the likes of van Gogh, Toulouse-Lautrec, Picasso, Degas, Monet, Manet, Hopper, Rothko. I began to think about my photography more than I had ever done before. Top plate of my OM-4Ti, fitted with the 50mm F1.4 Zuiko – this is the silver nose 50mm but the actual silver nose not visible in this picture. Note the spot metering button below the word ‘SPOT’: to take a reading you simply placed the part of the photo to be spot metered inside the microprism circle visible in the viewfinder and pressed this button; up to eight readings could be averaged. For photos with vivid whites, you spot metered the white, and then pressed the “HI.LIGHT” button, to achieve pure whites as opposed to muddy grey ones. Similarly, for photos where pure blacks were required, you spot metered the blacks and pressed the “SHADOW” button. So, both my OM-1 and OM-2 being unserviceable, I bought a second hand OM-4 and started using my 28mm, 50mm and 75mm-150mm Zuikos again, shooting Fuji Sensia and Provia colour transparencies. At first it was an uphill struggle and progress was slow: my pictures were really uninspired and I felt like I was back with the Kodak ‘Brownie’ again. The OM-4 was a joy to use. It has multiple spotmetering, able to average up to eight spot meter readings, together with the ability to set spot metering to render the brightest tones of a photo white or the darkest tones black. Yes, lightweight, compact, precise, the OM-4 was great – but those three Zuiko lenses just weren’t doing it for me any more. So cash flowed and more Zuikos appeared – and really the most useful of them all was a 21mm F3.5: extremely compact and with more of the wideangle width that I’d been hankering for. Telephotos of 85mm–250mm and 300mm focal length came and went: they were just too heavy to carry around. And I paid out a lot of money for the rare and fabled 90mm macro Zuiko but also found that lacking and sold it. For some reason I’d thought that landscapes and other rural subjects were the only genre for me, and while some of these photos were not bad, many were dreadful. But, without making any conscious effort to do so, I’d been seeing visually attractive scenarios in towns and cities for as long back as I can remember – these were mainly patterns resulting from colours, textures, lines, form and so on seen in such things as pavements, cars, shadows, architecture, water and reflections. I’d thought nothing about these, but now started wondering if I might be able to photograph them. And on 8th September 2003, in the grip of turmoil in my private life, I determined to do something about it, in two ways. First, I decided to walk around central Bristol, photographing anything I thought visually attractive, and especially so if the attraction arose from some kind of abstract design – graphics in the city, something I’d never tried before. Then, second, because I could see that low ISO colour slides were going to be a hindrance to handheld photography – and also that I’d heard that raising the ISO of films could provide attractively larger grain and more intense, even garish, colours, I pushed my Fuji Sensia 400 ISO slides two stops to 1600 ISO. The wait for the return of these pushed colour transparencies from the processing lab was filled with trepidation – but I was both amazed and pleased to find them really not at all bad. And so a new type of photography, looking for the graphic elements produced by pattern, colour, line, form and texture – what John Shaw (Landscape Photography; 1994) calls “Photo-graphics” – opened new possibilities for me and has been doing so ever since. I’ve since applied this graphic approach to everything else I photograph. There was a last flowering of my Olympus OM gear around this time. Most of my graphic images were taken with the 21mm Zuiko and the long end of the 75mm-150mm zoom: 21mm and150mm were the focal lengths I “saw” these graphics in – but I still felt a need for wider wideangles and longer telephotos. I later acquired a beautiful 135mm F2.8 Zuiko, and also an OM-4Ti, a more modern version of the OM-4, to accompany the OM-4 I already used. However, thinking and reading more and more about present day photography, it started to become clear to me that modern SLRs provided options that the Olympus cameras, good as they are, simply couldn’t match, e.g. autofocus both to aid my ageing eyes and to assist composition, dynamic autofocus, simplified access to multiple exposures, Nikon’s 3 dimensional colour matrix metering, the ability to customise your camera to your personal needs via custom functions, and so on. And gradually, as I read more and became more and more enthusiastic about photography as a means of personal expression, it became apparent that, much as I loved them, my Olympus OM cameras and lenses – all out of production and becoming more liable to breakdown by the day, were not the way forward. I began to look at other camera makes with currently available models. Purchasing of second hand (I mean, pre-owned!) equipment had ceased – I wanted something slap bang up to date. I wanted an SLR, and the two dominant brands were (and are) Canon and Nikon, and going through specifications and systems I favoured the latter. Thinking of their more moderately priced offerings, I eschewed the tank-like professional Nikon F5 in favour of the smaller and lighter F100 – and was fairly quickly disappointed. Much of this disappointment may well have been due to my own ineptitude, but I also had problems with the F100’s spot meter readings and a Google search shows that I was not the only F100 user encountering this problem. I was downcast – I’d spent a lot of money on this F100 and now it just wasn’t doing the business. And then, at the very time that development of professional 35mm film cameras was going down the tubes in the face of the rise of digital – at one minute to midnight, you might say – Nikon stunned the world by bringing out a final, high end film camera, the F6. I read and reread the F6’s review in the 4th December 2004 issue of Amateur Photographer, noting things like “bombproof” exposure metering; 100% viewfinder (so useful for shooting slides); exemplary build quality and design reflecting Nikon’s F series experience since 1959; lighter, more capable and far less bulky than the F5 and there was no question – regardless of expense, I had to get one! The F100 was speedily part exchanged for an F6, and here at last was a camera that didn’t disappoint in the slightest. I used to tell fellow enthusiasts that the F6 was the best thing I’d ever bought, making the point that I wasn’t just talking about the photographic gear that I’d bought, I was talking about the best of any sort of item they’d like to mention! I may not be so OTT now but, still, the F6 is a joy to use, it has never let me down, and it has taken some very solid pictures. There is the very slight possibility that I might part exchange my F6 if Nikon were to bring out something truly extraordinary in the digital camera field – but those thoughts are for later on, after something really completely different: compact film cameras. Then, having decided to stay with film rather than convert to digital capture, and having obtained the truly superb F6 and a useful collection of lenses to go with it, I went through the phase – well we all do I suppose, don’t we – where I didn’t want to have to carry all of this weighty photographic equipment around all of the time. I wanted to be able to go out for a stroll or to pop into town unencumbered by my formidable array of photographic gear, but to still have a small camera in my pocket … just in case. And so I researched compact film cameras and bought some – and then even tried going on holiday with only a compact. Did it all work? Was I freed from carting Nikon gear about? Well, partly, but nothing like entirely – and with nothing like the success that I’ve had with my Canon G11 digital “compact” – but more about that later on. Which film compacts did I try? 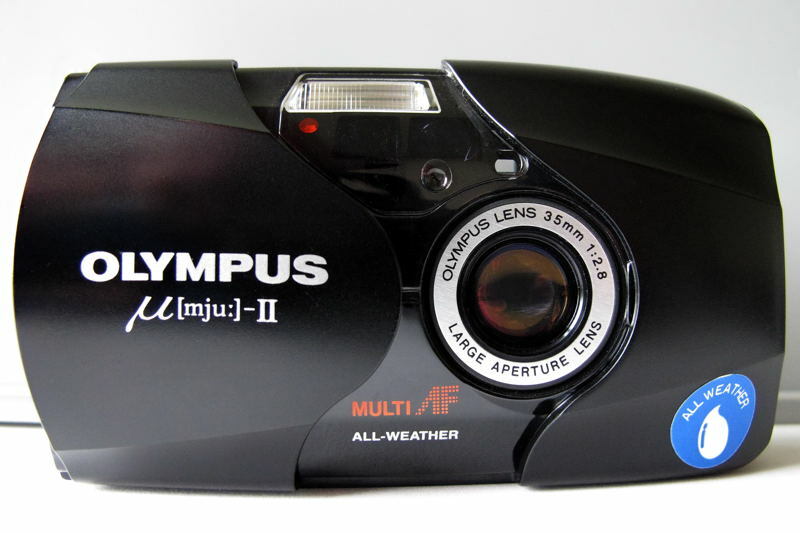 Quite improbably, The Sun newspaper advertised brand new Olympus mju-ii cameras at only £45 each – an offer too good to miss. A delightful and truly diminutive, semi weatherproof 35mm film camera, with 35mm F2.8 lens, autofocus and a lovely large and clear viewfinder, even for spectacle wearers. It is so small and easy to use that it has sold in millions around the world. I haven’t used it a lot but it does the business and it is truly pocketable. Then there is the Leica Minilux: built like a tank or, as one magazine (I think AP) put it, the size and shape of a tin of sardines. The Minilux has the famous Leica red spot and oozes class, the 40mm F2.4 Leica Summarit lens is sharp and the inbuilt exposure meter very accurate, easily good enough for colour slides. And last but not least, the beautiful, classic Ricoh GR1v. Once more, very pocketable and very photographically capable, but I’d bought it to use its manually adjustable ISO settings to push film (i.e. to circumvent automatic ISO setting via the DX bar code), only to find that its top speed is only 1/500th , which is not really fast enough for highly uprated ISOs. In summary, I found the film compacts enjoyable to use, but only rarely carried one around with me. We were on holiday in St Ives when the Minilux was the only camera with me and, although it did return some good pictures, I wished that I’d taken the F6 and the 24mm-120mm Nikkor zoom instead. So, film compacts were not really my thing. What next? A very big surprise was just around the corner, and it changed my photography completely. So, there I was, photographing with the superb Nikon F6, and also tootling around now and again with film compacts and with my Olympus OM-4 gear. Had digital photography not arrived, I would doubtless have stayed with the F6, shooting some black and white, but far more favouring colour transparency films like Fuji Provia 400X (excellent quality, and readily accepting being pushed to 3,200 ISO or more) and Velvia 50. I’ve already mentioned the sad and unfortunate demise of Agfa Scala monochrome reversal film. and, because of my collection of Nikkor lenses, I was and remain, for better or for worse (actually it has definitely got to be for better), brand loyal to Nikon – whose whole DSLR range used digital sensors smaller than the 35mm format film frame (Nikon’s DX format). My prejudices against digital capture were exacerbated by the thoughts that (a) the focal lengths of all my lenses would be increased by x1.5 on DX camera bodies, while (b) their depths of field would be increased, making the isolation of subjects by selective focus more difficult. Nikon’s great rival, Canon, had already brought out full (35mm format sized) frame DSLRs, and Nikon users were clamouring for the same. Some professional Nikon users switched to Canon because of the lack of a full frame Nikon DSLR. Then, late in 2007, Nikon introduced the groundbreaking D3 DSLR, which at last presented Nikon users with a full frame machine that can use the Nikon F mount of the lenses they were using on their film Nikons and, the cruncher really, that boasted totally unheard of picture quality in poor light – up to an astonishing 25,600 ISO. There were tales of professional photographers going back to Nikon, and of the D3’s “filmlike” quality. I read all about the D3 with a kind of awe, while realising that it was still not for me – because it is too big and heavy (it has a built in high speed motor drive) – and also because of the pricetag, which was then not far off £4,000. So >>> I continued burning film, continuing to marvel at the F6’s capabilities and simply enjoying using it – what a camera! But then, out of the blue in 2008, the unthinkable happened – Nikon brought out a full frame DSLR, the D700, that equalled the D3’s performance while being decidedly lighter and less bulky (it has no incorporated high speed motor drive) – and £1,000 cheaper. I read the in depth review in Amateur Photographer (23 Aug 2008 issue) and it was a no-brainer. Here was a universally acclaimed camera, that many once more said produced filmlike results, and that would accept all of my Nikon F mount lenses – without any focal length changes. However, I procrastinated >>> and was appalled when Nikon announced price rises right across their camera range! Panic! – but offering a dealer in Bath an instant sale if he could secure me a D700 at the old price, he rapidly found one in (where else?) Merthyr Tydfil. I remember getting it home, charging the battery and taking a random shot, which instantly appeared in its LCD screen – and I thought “This is the start of something new!”. And it was. Nikon have been building single lens reflex cameras since the Nikon F, way back in 1959, and they are very good at it. The F6 is a dream with regard to handling and performance, and the D700 is right up there alongside it – in fact I often think of the D700 as the digital equivalent of the F6 – and I know I’m not alone in that view. The F6 is of course a really top notch professional camera and the D700 is not quite that, but for me they are two versions of the same, wonderful thing. Much has been made of the fact that the D700 has ‘only’ 12 megapixels but I have found this no drawback at all. I only print my pictures up to 9 inches by 6 inches – but even when I crop to just small portions of the images, I cannot detect any significant drop off in quality. And this ‘low’ MP size is more than compensated for by the camera’s abilities in low light – e.g. blasting away at 6,400 ISO across the Christmas dinner table and producing very acceptable results. If I were to design a ‘perfect D700’, I would give it a 100% viewfinder like that on the F6. But the D700’s 95% has caused me no problems – because, unlike when using colour transparencies, any misframing with the D700 can mended digitally, i.e. with a slight crop. I’m concerned about getting dust on the D700’s sensor (more about that later), but the fact is that the restriction of the D700’s viewfinder to 95% field of view was due to the incorporation into the body of a self-cleaning sensor unit – which is not something found on the far more expensive D3. So, I’m more than happy with the D700. Its hard to imagine a more enjoyable introduction to digital photography. I’m intrigued by the prospect of Nikon updating the D700, I’m looking forward to seeing that camera very much – but should the new model merely feature more megapixels and perhaps very adept movie abilities, I think I may just stay with what I’ve got – we shall see! I regard the Nikon F6 and D700 as exceptional cameras. But – and there’s always a ‘but’, isn’t there? – the F6 and D700 and their Nikkor lenses are neither the smallest nor the lightest bits of photographic gear around, and there inevitably come times when either I don’t want to carry bulky gear around or I’m simply unable to. It’s the same for every photographer who doesn’t use relatively compact cameras as their primary weapon – however good your main gear, there always comes a time when you need something more pocketable – and your mind turns to more compact and lightweight cameras. I’ve already written about my rather ambivalent dalliance with film compacts. So, I thought about a good digital compact >>> and criteria instantly arose. I needed a camera to have a viewfinder because I was (and am) simply unwilling to settle for a fixed LCD screen on a camera’s back. Even the rear LCD on my D700 is hard to use in anything like bright light – and there is no way in the world, no way at all, that I am going to be continually restricted to holding a camera out in front of my face in order to take a picture. Having made this decision, I was depressed to find just how few modern digital compacts do have a viewfinder. And then, out of the very few alternatives, I had a tremendous stroke of luck – even though it was plain that its viewfinder is really not top class, I decided to buy a Canon PowerShot G11 – and became more or less instantly captivated with its fully articulated LCD screen! The situation has been very straightforward. I have (successfully) used the G11’s viewfinder when my subject is moving too fast for the LCD to catch it. The G11 has a special Quick Shot Mode in which, when you are looking through the viewfinder and have the shutter release partly depressed, the G11 continuously adjusts the focus and exposure of what you are looking at through the viewfinder, so that when you see a picture, quickly depressing the shutter release for the rest of its travel gets you that picture. I was rather surprised when I found that this procedure works, but work it does. However, the vast majority of my pictures have been taken via the wonderful articulated LCD screen – which can even be turned to face towards the photographer, making self-portraits easy. So, the G11 – a just about adequate viewfinder, Quick Shot Mode, a fantastic fully articulated LCD – but what else? 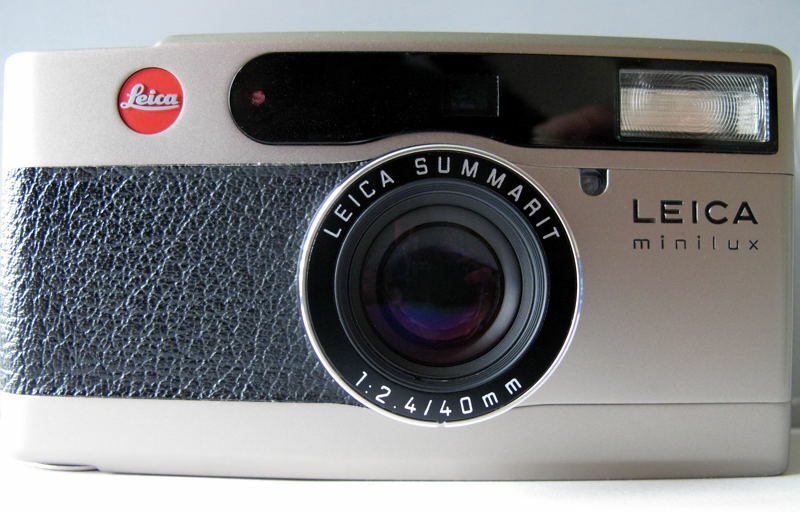 In section 4 of these screeds I wrote about the Leica Minilux, noting that it is built like a tank, and that Amateur Photographer considered it the size and shape of a tin of sardines. Well, I am sitting here now with the Minilux in one hand and the G11 in the other, and they’re both about the same weight, and there’s not much in it as regards height/width/depth. Which means that the G11 is not the smallest – or even smaller – of the compacts around, but it does have a reassuring weightiness and build quality – it feels like a camera built to last. And when carrying it around, I have never noticed its weight or (relative) bulk in the least. Furthermore, the G11 has a very useful and instantly available macro mode. I’ve evolved a grip for using the G11 in situations, especially those in close up photography or spatially awkward places, where low shutter speed might lead to camera shake. I always use the G11’s in camera vibration reduction of course, but I find that if I lay the first two fingers of my right hand under the G11’s bottom plate, I can keep my thumb resting on the shutter release, holding it at half depression – and gazing down into LCD I can give the very gentlest squeeze with my thumb to achieve a shake free exposure at the instant that I require it. I can successfully use the G11 like this, using only my right hand. Another useful grip that I’ve discovered is to have my right hand holding the G11 as described – and with the articulated screen out at 180 degrees to the camera’s body and facing straight upwards. In this configuration, I can use my left hand to firmly take hold of the screen, while looking closely down into it, to see exactly what the camera is seeing. Once again, a very gentle press of my right thumb and the picture is there. In terms of speed of use, the G11 has very visible and easily adjustable dials on its top plate for exposure mode, ISO speed and exposure compensation – far better than having these important items buried in a menu somewhere – and this makes the G11 very easy and quick to use. I realise that I’m naïve and technologically often behind the times >>> but I still find a tinge of magic in looking at the picture in the articulated LCD screen – and then seeing that screen lighten and darken as I alter the exposure compensation – its so useful to be able to see the picture as its going to be, before taking it! And, as every photographer knows, when we elect to take to take only a compact out with us, there are times when we wish we had taken our better gear instead. I’ve found this – notably on the Somerset Levels – and wished I’d had the D700 with me. I can only say that the G11 has often done a remarkable job in such situations – which builds up my confidence in it no end. And any worries that I might have had about the smaller sensor size vis a vis the D700 have really not manifested themselves in reality. I feel extremely lucky to have chosen the G11 – but I’m not going to buy its (already produced) ‘upgrade’, the G12, as I don’t need its extra features. Being a definite Nikon fan, I would have liked a Nikon compact, but from my reading here and there I’m not impressed – and being that their SLRs and DSLRs are so good, I find this situation frustrating. And the fact that Nikon’s recent Coolpix P7000 digital compact is so similar in looks to the G11 and G12 also starts alarm bells ringing in my mind ….. So, here I am, with two very capable digital cameras. Next time >>> how do I use them, what is my take on digital photography, workflow, file types, white balance, software, the whole box of tricks? I suppose that my first concern about digital photography – and perhaps my foremost concern – is the danger of getting dirt on the camera’s sensor. This concern is most probably fuelled by the high cost of the D700, and the hope that the one I have will last a long time! The sensor in a film camera is the film, and thus film camera sensors get changed every 36 shots, when a fresh sensor is inserted. So, any dust on a film will only affect that particular film – except of course that dust getting into the camera can have many other serious consequences, far over and beyond making linear scratch marks on the resulting pictures. However, be that as it may, except in dusty / sea spray etc environments, I never have a second thought about changing lenses on my F6 or OM-4 – the ability to change lenses is one of the huge benefits of an SLR. and to more or less expensive professional cleaning facilities. The bottom line here – signalling that the problem of dirty sensors is far from resolved – came in an article in Amateur Photographer, I think a year or two back, which ended with the advice that the most important thing that you can do to keep your sensor clean is to be extra careful when changing the lenses of your digital camera outdoors. lastly the second lens is swiftly attached to the camera, still with the camera body facing down. This sounds rather an awkward process, but it soon becomes habitual and easy – and, fingers crossed, I’ve had no dust problems to date (my D700 is just over two years old). BUT, not having had any dust problems may also in part be due to two other factors. First, the D700 has an inbuilt sensor cleaning system which I have to set to activate whenever the camera is switched on or off. Then second, I often take the D700 out on photographic forays with no other lenses but the one prime or zoom that is attached to it – so that I never have to make any lens changes at all while outdoors. This may seem a little extreme and, after all, what is the point of having an interchangeable lens camera if you don’t change its lenses? Well, yes, but I find that going somewhere with only a single lens is something of a challenge – and also a very worthwhile discipline – because it forces me to look for pictures that can be captured with my single available optic. It is perhaps a strange thing to say, but the simple fact is that I have been photographing for so long now, and have taken so many photos, that I no longer care whether a photographic trip yields any pictures or not –>>> as its simply a pleasure being out and about with the camera – and having the potential to create photos if I want to. And so I just stroll around – enjoying the moment, enjoying where I am – and if my eyes spot something visually interesting and attractive, I may photograph it. Perhaps its useful to add here that if I see something with real photographic potential, I often take at least several shots of it, if not far more than several. This is because I’ve found that, in many instances, my initial shot does not end up as the leader of the pack – something taken later on, when the subject has been more thoroughly studied and thought about, turns out to be better. And having only a camera and one lens means, of course, that my kit is (relatively) lightweight and portable – I’m not weighed down by taking a lens to cover absolutely every photographic opportunity that might conceivably arise. Sometimes I’ll go out with a favourite lens – a lens that matches how I ‘see’ – like the 70mm-300mm VR Nikkor, but other times I’ll take something quite different – the Sigma 15mm fullframe fisheye for example – just to ‘see what happens visually’. So, what next? Let’s take a look at hardware and software. I have only an average, run of the mill PC, purchased from a High Street store. Since I never print any of my own photos (more on that in the next article), this PC is accompanied by a cheap and basic Epson printer. The only item that may be a little up market is my monitor, a 47×30 cm flat screen which is very useful for photographic work. In terms of digital storage, all of the my photos are on my hard drive. Every two weeks or so, I back them up onto a Transcend 320Gb portable hard drive. Several SanDisk Cruzer MicroSkin memory sticks, up to 8Gb capacity, are used for more frequent backing up of ongoing projects – like this one. My digital capture is entirely in Raw format, with both the D700 and the G11. The D700 has a SanDisk 8Gb Extreme IV memory card which facilitates shooting extended sequences with the motor drive, on the very rare occasions that I use it. This SanDisk card allows me around 300 Raw photos with the D700 – this figure far exceeds the number of photos I shoot on days out or holidays and so this card is never taken out of the camera. The same is true of the 8Gb SanDisk Ultra card that is in the G11: it never leaves the camera and it can store similarly large numbers of Raw files. The D700 came with two very useful batches of software. Nikon Transfer efficiently copies pictures from camera to computer, and ViewNX is very useful for organising and viewing pictures. Since I use Nikon gear, I started off digitally manipulating photos with that company’s Capture NX2 image processing software, and have stayed with it. Its not as powerful as Photoshop, but it fulfils my rather limited needs – and I feel very much at home with it. The G11 was bundled with Canon’s CameraWindow for file transfer from the G11, ZoomBrowser EX for viewing and organising pictures, and Digital Photo Professional for manipulating them. All of these packages work well, but most of my manipulation takes place in Capture NX2 and Silver Efex Pro (see below). I also have Photoshop Elements 7, which I mainly use as a conduit for two plug-ins. Alien Skin’s Exposure 2 was purchased mainly to nourish my enthusiasm for monochrome photography. However, I tend not to use Exposure 2 much now, having shifted very decidedly to using Nik Software’s Silver Efex Pro which I (and many others) consider essential for mono work. I hear that Nik have released an upgrade. I’ve yet to see it (but definitely want it!) – although there are stories about problems with this upgrade’s first release. The photographic tool which I’ve been most impressed with recently however – the tool that makes much of this blog possible – is a Plustek OpticFilm 7600i film scanner. Its not for anyone wanting speedy scanning but – far more important to me – it really does the business with both negative and positive film – and it has produced most of the film shots presented in this blog (prior to getting this scanner, I had a few films scanned commercially). I think the Plustek cost just over £200 – and, based on its results, I rate this excellent value. This little machine, for all its strange operating noises and unhurried workflow, is a gem – it makes old photos come alive again, either in their original guise, or in new, digitally manipulated permutations. What’s coming here next? Finally in my take on digital, its printing and presentation. In the (good???) ‘old’ days, I shot mostly colour transparencies and presented them – in bright, beautiful and very vibrant colours – in slide shows. Points of interest were pointed out initially with a long stick and later, in a nod to modernisation, with a laser pointer. People came round expecting to see dreary holiday snaps (“and here is another one of us in front of those frightful toilets at Crudwell-On-Sea, but this one’s a bit dark though… don’t know why …”) and got something different. The Nikon F6 is ideal for slides: it has a bright, 100% viewfinder for precise framing, and its superb exposure metering facilities ensure precisely correct exposure – which colour slides demand. The OM-4, especially in view of its advanced multi-spot metering, is also excellent for shooting slides. The transparency film that I used most was Fuji Provia 400 and then its even better reincarnation, Fuji Provia 400X – a fine grained 400 ISO reversal film with excellent colour rendition – that can readily be pushed to 3200 ISO at least, with good results. I often rated these two Provia films at 500 ISO, to improve colour saturation. When very fine detail was required, especially for macro and similar work that required a tripod, I favoured the 50 ISO version of Fuji Velvia, often rated at 64 ISO to further improve the already excellent colour saturation – and sometimes I pushed this film to 100 ISO, with good results. And I used Agfa Scala monochrome slides until that truly superb film was discontinued. It was rated at 200 ISO, but could readily be pushed to 1600 ISO. For me, the loss of Agfa Scala has been the saddest result of the digital photography revolution. I also shot monochrome prints sometimes, using Ilford HP5 and Kodak Tri-X, and sometimes higher speed Ilford offerings. And another film that I really liked but which may by now be discontinued was Fuji Neopan 1600 – just wonderful stuff. Decades ago I printed my own black and white photos in wet darkrooms, but all of my recent monochrome prints were (very well) printed by Karen Willson http://www.karenwillsontraditionalphotoprocessing.co.uk , here in Bristol. I used to take some colour prints too – but the name of the films elude me – which means they can’t have been very special. That was presentation of film images. Now, onto digital – but how to approach it, what to do? An immediate and firm decision was that no worthwhile photos were going to be stored only on digital media – which meant that they were going to be printed. This decision to print was arrived at relatively easily. First, I spend my days working with computers in the office, and I am all to conscious of the risks of hardware and software failure. Second, rather than a computer image, I definitely want to “have something in my hand”, a real, tangible photograph, not an electronic one. And I want prints to put into albums (see more on this below), which lend themselves to viewing anywhere, as opposed to being tied to a computer, even if a laptop. … AND I LANDED ON MY FEET!!! A company in Cheltenham, The Darkroom UK Ltd, had been processing (and often push processing) my colour transparencies for sometime, with faultless results and very quick turnaround, and so I thought to try them with my digital files. Uploading pictures to them over the internet was easy, and our post very soon contained the resulting prints – which were just what I wanted – the photos appeared just as they do on my PC! In particular, black and white is black and white, and not some muddy mixture of dirty white and pale greenish grey. Wonderful! The door to digital printing was open! The Darkroom is at http://www.the-darkroom.co.uk , and I fully recommend them, both for the quality of their film and digital services, and for their very customer oriented approach – any problem is immediately addressed. If you are like me and know little about modern printing, I recommend Lee Frost’s article Print On Demand in the June 2010 issue of B+W Photography magasine. Lee goes through the basics of commercial digital printing, and assesses the services of eight reputable companies. Lee rates The Darkroom right up there with the best – “…print quality is as good as it gets – images are rendered super-sharp, perfectly neutral and wonderfully crisp.”. This article is worth reading. Back issues of B+W can be obtained from their credit card hotline +44 (0) 1273 488005, or by emailing pubs@thegmcgroup.com, or by sending a cheque to GMC Publications Ltd, FREEPOST BR2265, Lewes, East Sussex BN7 1BR. Last year back issues cost around £5 + 50p postage – check for the current price. One thing that Lee delves into is the difference between inkjet (aka giclee) prints and C-type prints. Everyone understands the way in which inkjet prints are made – indeed many make their own inkjet prints at home. But C-type prints are less well known I suspect – and quite different. They are generated by substantial and highly expensive machines that produce their images by exposing real photographic paper to digital images via LEDs or CCDs, after which the pictures are developed by the usual wet chemical methods. The disadvantage here is that C-type prints are made with only a small selection of photographic papers – The Darkroom offers gloss, matt or metallic options – but the advantage is excellent image quality, as Lee says “… supposedly much better than anything an inkjet printer can do.”. All I can say here is that I’ve been ordering C-type prints from The Darkroom for over two years and the quality has been superb – as I said before, what I see on my PC’s monitor is what I get back on the prints. I standardise on 9×6 inch prints to fit in albums (more on this below), and The Darkroom’s pricing structure soon makes them inexpensive. If you order up to 9 prints (either 9 of the same print or 9 different prints or any mixture of the two), they are a hefty £3.15 each, but if you order anywhere between 10 and 24, they drop to 69p each, and they go on getting cheaper the more you order – until 100+ are 50p each. So now, in the digital age, how do I share my photos with others? Well, latterly of course, via this blog. Next, digital projectors are available, but I’ve heard that those of any quality are quite pricey – and perhaps not designed for enthusiasts, but more for presentations in the sectors of commerce and business. For family and good friends I make up collections of The Darkroom’s excellent 9×6 inch prints, mounted in black-leaved photograph albums. These are traditional photograph albums – not the self adhesive or pocket types – and the photos are secured to the pages by Multi-Mount, which is an inexpensive, easy to use, acid free, double sided mounting tape, which I obtain from WH Smith. If you have trouble finding this product, it is made by Aerodex Floyd, Buckingham MK18 1FY. I’ve used black-leaved albums with page size about 10×11 inches produced by WH Smith – and often available at half price on this firm’s website. I’ve also used a black-leaved album of page size around 11″ square from Harrison Cameras, and this also looks to be a good product – with many more pages than the Smith’s product. However, while they continue to be produced, I’m standardising in the Smith’s version. Each album page displays a single 9×6” photo and, bottom right, a small, white, handwritten page number. The lists of photos and page numbers in each album are word processed, and these indexes are used in two ways. First, an index in Arial font size 12 is kept loose leaved, and stapled top right. This index is for reading while the photos are actually in view – and many have commented favourably on this – you can read about each photo as you are looking at it. Then a second index at font size 10 is stuck into the end pages of each album – in case the loose leaf version is ever lost. To me, the giving of albums is a very personal thing – and especially so where an album contains photos of the recipients. In a nutshell, I put a lot of myself – character, visual philosophy, written sections, mindsets, opinions, etc – into these albums and they are a part of me. As noted above, they are tangible objects, which have weight, three dimensional presence, smell, physical textures >>> and when I die, they will remain as much more personal reminders of how I was than can be formed from the dialling up of a web address to see images and written pieces – held on some unknown server – on a computer monitor. Having said all of that though, the publishing of photos via this blog provides very substantial satisfaction, and very certainly continues to be a means of significant creative output – I enjoy showing my photos to others worldwide and, in particular, I enjoy writing about these images – and I’m also greatly enjoying meeting like minds from around the globe. I’ve recently added Twitter to these proceedings, in the hope of reaching an even greater global audience. greatly enjoying firing off my pics around the globe, and meeting like-minded souls. What comes next here? No idea at all, but I’ll think about it! I have looked at your web pages many times, probably spent hours doing so. Excellent, but tell me what theme is it run on? Hello, Mike, very good to hear from you. I’ve been running my blog for 7 years now and, throughout, it has used the Enterprise theme – which must be getting a bit long in the tooth by now, but which I chose, at least in part, because it has a sidebar, which I find a very useful thing. It might be better to have a blog with a black background, but I’m happy enough with Enterprise, and I’m really into unhindered photography and writing which – touch wood!!! – is what this theme facilitates. Evening Adrian. Well that passed away half an hour reading your article. I wish I could remeber a fraction of what you remember and written down. An interesting read. Okay, now I see. You’ve been in Kenya before. And I’m sure have a quite a story with you. Yes, quite a story. I think that my years in Kenya have helped shape who I am, and I am very grateful for them. I have been back in England a long time now, but I don’t think I’ve ever fitted completely back in here. 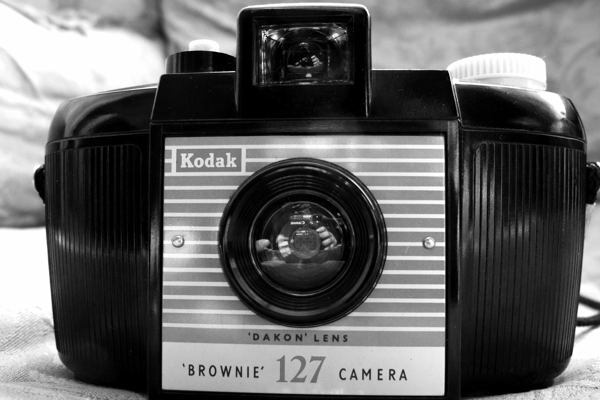 I see that your Brownie had a ‘Dakon” lens. With an extra i you could’ve had a ‘Daikon’ to munch on if you got hungry from being out and about while taking pictures. Now that you know what daikon is, you might try adding some to the next green salad you make. Daikon is very large (in fact the word means ‘big radish’ in Japanese) so you get a lot for your money—assuming, of course, that daikon is sold in grocery stores in your area. It’s readily available here in Austin. Hi Adrian – V much enjoyed your information-packed tale of your photographic upbringing! You’ve reminded me of some things that I’d forgotten about the Olympus OM-1 in particular. I do like your monochromes, esp the more abstract images. And thanks, glad you like my blog page about my own battle weary OM-1, 38 years young! I’m putting up some favourite shots on my blog page, many from the OM-1, which I hope you’ll enjoy. Recently, I have been using a pocketable digital compact, the Canon S90…which shares some DNA with your G11. Have you had much recent success with slide-scanning (to digital files)? Hello, Owen, glad you enjoyed my photographic history – that all seems a long time ago now! I’ve scanned a lot of my colour slides, and also some mono (Agfa Scala) slides too – I used a plustek OpticFilm 7600i slide scanner, which puffed and chugged away, which was not fast, but which certainly did the job – you can see many of my scanned slides on my blog eg all of the Kenyan ones and some from Bristol and the Somerset Levels. I think this company has more recent scanner offerings now. This scanner came with software, but I set up standard settings, and then processed the resulting files in Nikon’s Capture NX2, and also Nik Software’s Silver Efex Pro – which I very much recommend. I tried getting to your blog via your darklanternowen name but your blog could not be found. However when I tried the link you gave, it found it fine. But unless I’m looking in the wrong place, I couldn’t find many images there – could well be my error. Sorry Adrian, I am scanning & uploading old pics gradually – I’ve put up a couple more nice ones today – http://darklanternforowen.wordpress.com/ Enjoy! Yes, there is something aniss with my wordpress username link, I will try to sort it. Great post. I miss my Om-2n, great cameras with fantastic lens. The good ole days. Thanks, Darrell – and good to see your photos this morning! Yes, the good ole days – I’d never have been able to carry an SLR + 3 lenses around Kenya if the OM gear had been the size of my Nikon gear. But, as you say on your blog, the advent of digital has brought vastly enhanced flexibility and creative potential >>> its a no brainer! In fact I’ve recently traded in a lot of my OM gear for a Nikon D800 – I’m simply not going to use film cameras any more. Like you, I hung on with film, certain that it was my medium – but when Nikon brought out the D700, it seemed – and was – so comparable to my Nikon F6, that it changed everything. Hi Rob, good to hear from you! Yes, I’m a big OM fan, tho I never use the gear now – and I have the 28mm f2 lens, which is simply beautiful. Hello Adrian – good to see that old Olympus kit – I still use my Om1/2 every week and it’s never let me down yet. Really like your stuff – good to see it!